My current quilt project is in time-out. I’ll spare you the full story, but highlights include me sewing many straight lines of quilting, me stubbornly continuing even though the quilting didn’t look so great, and me spending many hours ripping all of it out. Sigh. My crafty little heart needed a finish. So I turned to Lazy Girl Design’s Mini Miranda Bag. 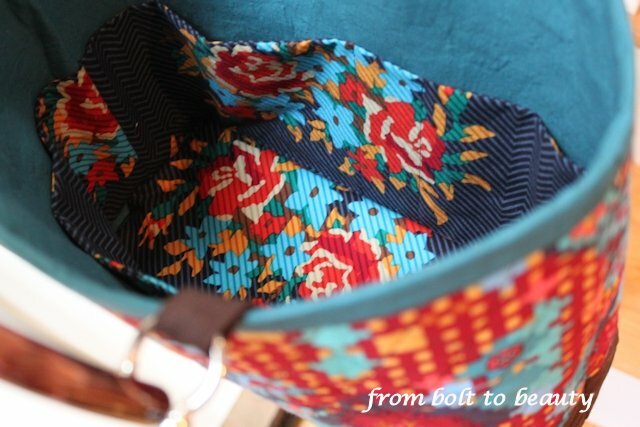 If you’re new to From Bolt to Beauty, you’ll quickly learn that I like making the same bags again and again. They’re my slam-dunk in-between-quilts projects. I’ve made this pattern three times before, all as gifts. This version, however, is for me. Compared to my experiences with my Cosmo Bag, this pattern was easy. 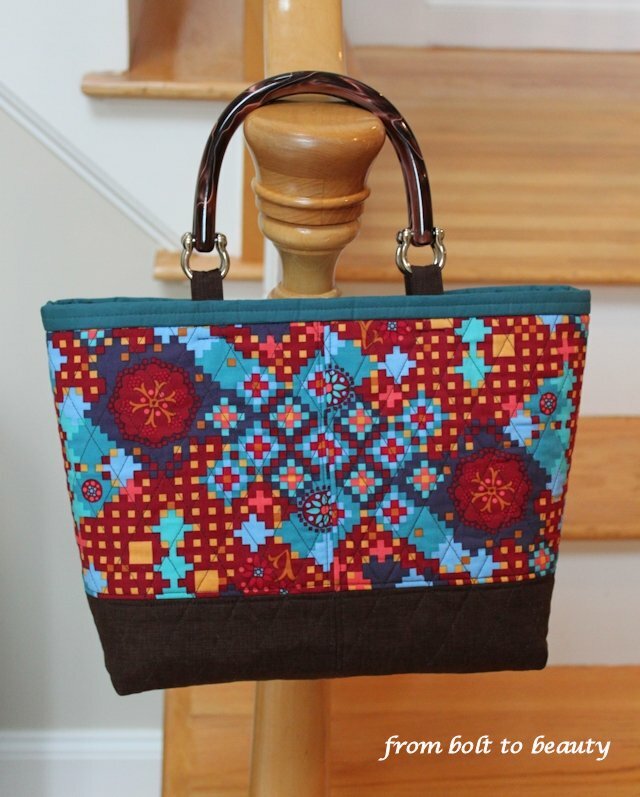 I paired Anna Maria Horner’s Postage Due, from her Dowry line, with Quilter’s Linen in chocolate and lined the bag with Michael Miller’s Cotton Couture in teal. 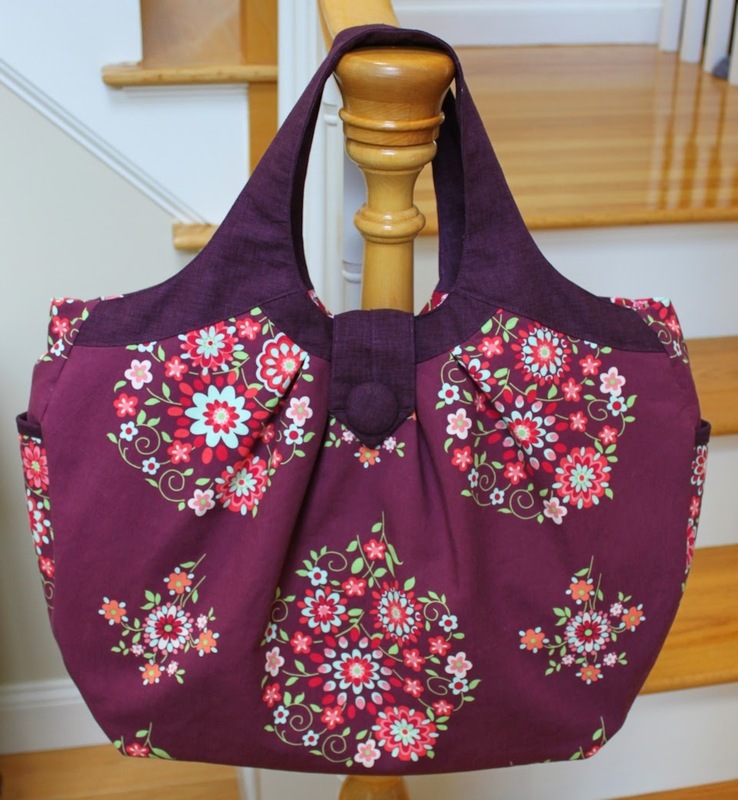 The inside pockets were made with Twill Bouquet, another Dowry fabric, and I finished the bag by using some Clover handles instead of making ones out of fabric. Although the construction is straight-forward, the result is elegant, don’t you think? 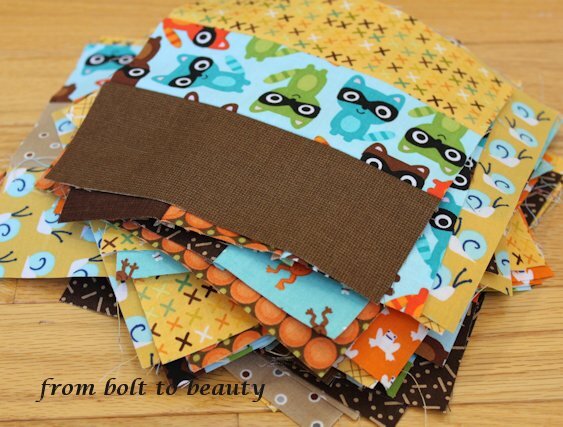 I was happy to use some of my AMH stash. I love her work, but so many of her designs have big repeats. It breaks my heart to chop them up for the sake of a quilt. (I could say the same of Amy Butler’s fabric designs.) Of course, fussy-cutting around the motifs created a lot of waste. I’ll have to put the remnants to good use. Maybe they’ll end up in a quilt after all. Speaking of quilts, it’s time to deal with the aforementioned one. I tweaked something on my machine and am ready to give it another go. Wish me luck! I lost more brain cells than I can count this past Saturday night. I wish I could say it was the result of a night of fun and merriment, but that could not be further from the truth. I accompanied my little guy on an overnight sleep study at a local pediatric hospital. A four-year-old who doesn’t understand why he is being hooked up to a bazillion wires + the not-conducive-to-sleep environment of a hospital (oh, the irony!) = four hours of shut-eye for Mama. The happy ending is, we survived and (I hope!) will never have to go through that ordeal again. Sunday was a wash. No church. No trip to the playground. No getting a head start on meals for the week. I caught up on laundry until I crashed hard and fast before noon. This was not a day for sewing. When your brain function is as low as mine was, playing with pins, needles, and rotary blades is not advisable. But come midafternoon I was starting to feel like a real person again. I passed on my top-priority project at hand, which involves manipulating fiddly 2.5-inch squares and matching many seams, for some super-easy piecing. 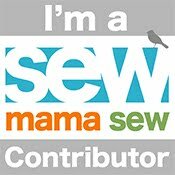 Sewing a straight seam? Yeah, that’s about all I could handle. I’m following Amanda Jean’s instructions for this project. Most of the fabrics have been languishing in my scrap pile; I recognize a bunch of them as leftovers from my rainbow pencil roll. Others, like the orange frogs and yellow-backed snails from Rae Hoestra’s Lotus Pond line, are from my stash. I bought the moose and raccoons—both from Robert Kaufman’s Woodland Pals line—to flesh out the palette of mustard, orange, aqua, and brown. I have 99 6-inch blocks, enough for a substantial throw-size quilt. I’d love to keep going with this, but my brain activity is back to normal. 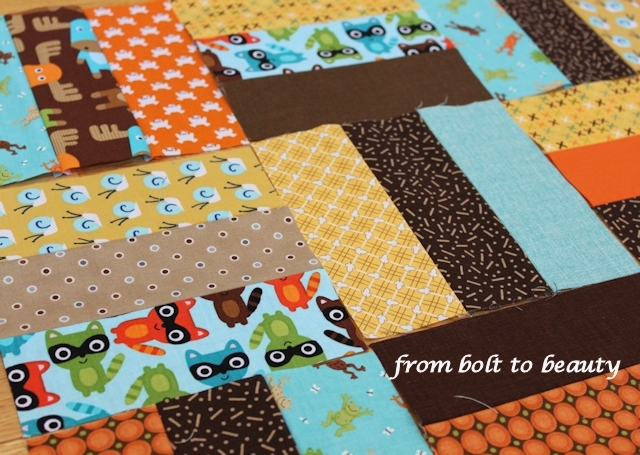 It’s time to tackle those 2.5-inch squares, fiddly or not. BTW: My son is just fine! He is not symptomatic for sleep issues, but he is at higher-than-average risk for them. I’m hoping that the study results show he’s sleeping A-OK.
I’m not entirely sure what possessed me to use my limited sewing time to make a Rubik’s Cube. Perhaps it was the knowledge that the theme for this month’s Le Challenge is “era” and that a Rubik’s Cube points back to my childhood in the eighties. Perhaps it was mere procrastination: focusing on the cube prevented me from tackling more difficult projects on my to-do list. The real reason why I made a Rubik’s Cube? Because I can. Some quilters’ lists would include fabric. Don’t get me wrong—I love fabric—but I recently held on to a gift certificate to Pink Chalk Fabrics for almost three months before using it. Clearly, food aside, I am a pillar of self-control! After all, gift-certificate fabric shopping is the best kind of fabric shopping: it’s guilt-free fabric shopping. Granted, I have been trying to use the fabric I already own, working on purge projects and purge quilts. But I also won this gift certificate as Pink Chalk’s featured sewist back in June, which makes it that much more important to spend it on special fabrics. I got (from left to right) Carolyn Gavin’s Polka Dot Daisy, Joel Dewberry’s Hydrangea, and Elizabeth Olwen’s Deco Floral. The navy daisy print is, in my opinion, a great all-purpose stash addition. I’ve been using navy a lot lately (here and here) and foresee that the trend will continue. 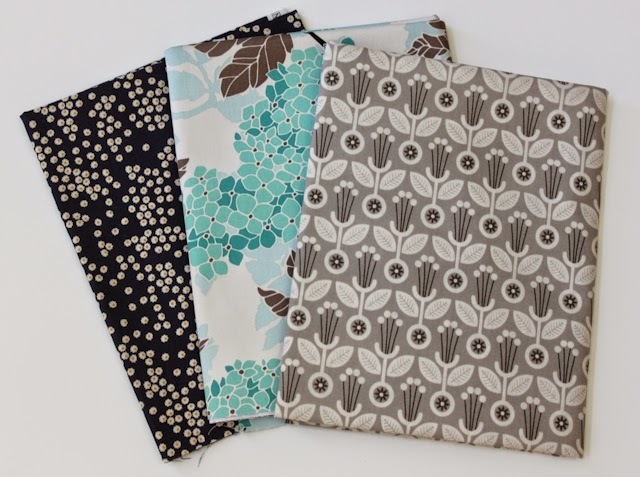 The hydrangea print, unlike the other two, is a sateen, not a quilting cotton. It’s sooo nice. My LQS doesn’t stock anything from Joel’s Birch Farm line, and now that I see it in person, the fabric is just beautiful. I love how this colorway pairs a sky blue with a robin’s egg blue. It’s not a combination I’d make on my own, and it works. I think the Deco Floral, however, steals the spotlight. It’s modern with a hint of Art Deco. My only regret is that I didn’t buy more. Will one yard be enough? Do I Like This Quilt? 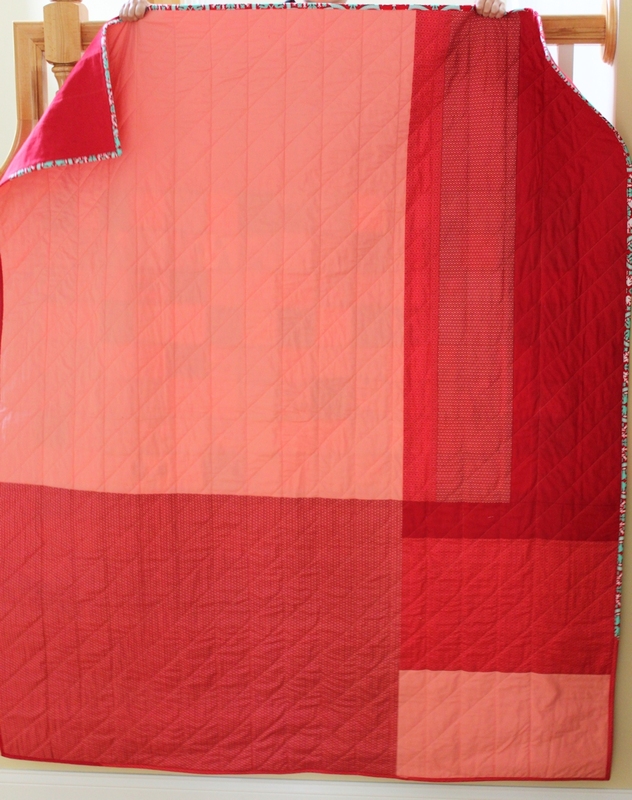 I’ve spent more time than is necessary—or perhaps normal—trying to decide whether I like my most recent quilt finish. It started as part of my purge effort, prompted by Stitched in Color’s exhortation to use up our neglected fabric, the stuff we’ve had for way too long. And the parameters I set up were significant: make a quilt with that fabric, buying as little yardage as I could to finish it up. I had Lotta Jansdotter’s teal stripes, Joel Dewberry’s intricate Historic Tile in tomato and teal, Bonnie and Camille’s coral dots, the tiny gray checks, lots (lots!) of Kona Salmon, and scrapage from Denyse Schmidt and Tula Pink. I bought a little Bella Solids in Bermuda, some of Lizzy House’s Jewels in poppy, and lots (lots!) of Kona Cardinal. 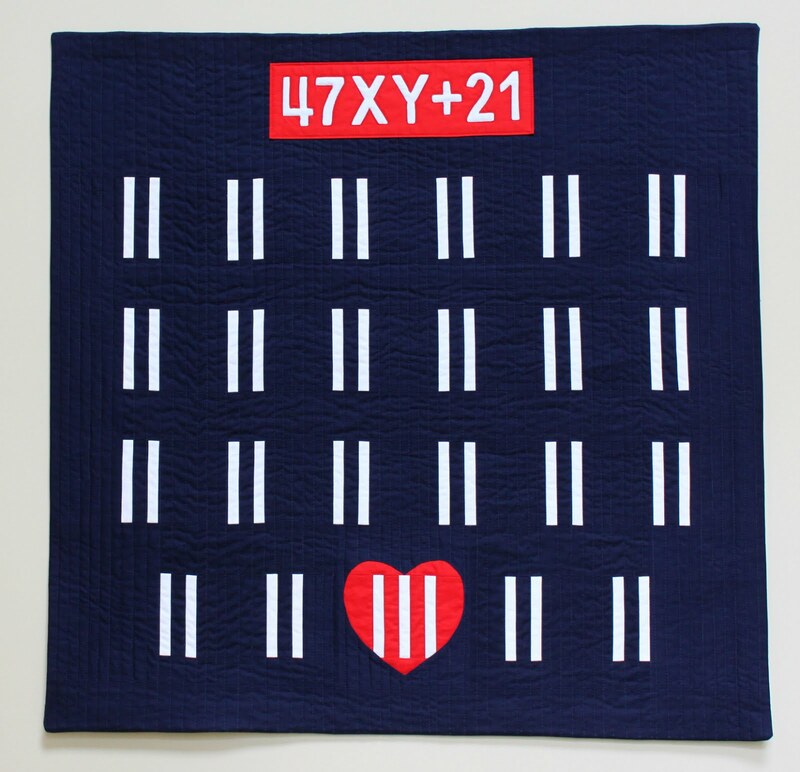 The jury of one has reached a decision: I like this quilt. Admittedly, it’s very un-Michelle. It’s bright! There’s almost no white on this quilt! And it’s bright! But if given the same constraints, I’d probably produce something comparable to what you see here. My only regret is the uneven border on the front. It drives me a little batty. 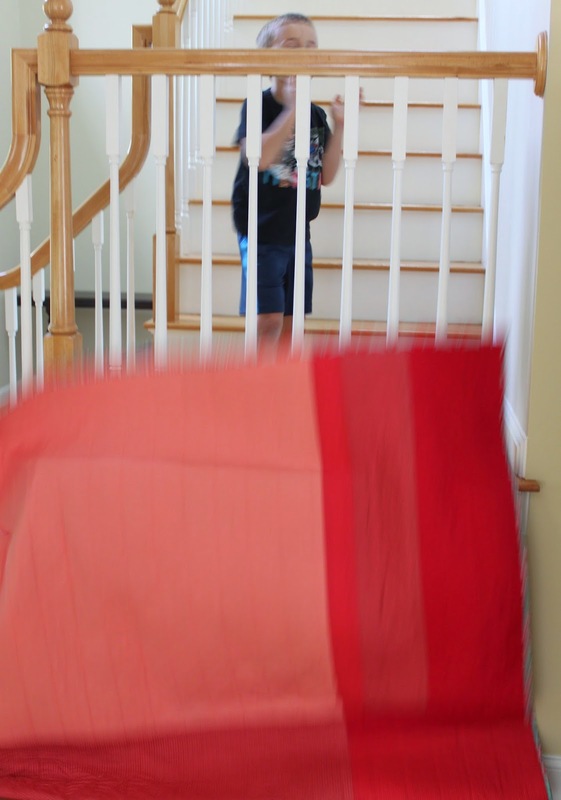 no quilts were harmed in this photo shoot. She’s done! If you follow me on Instagram, you know that I’ve been working on an Amy Butler bag. This is one of the projects I selected as part of Stitched in Color’s effort to use those overlooked and neglected fabrics in our stashes. Case in point: two amazing Amy Butler fabrics—both from her Love line—that I have had for a long time. I purchased the purple fabric during my wraparound skirt phase, so I had more than 2 yards of it. (Somehow during that phase, I ended up with one wraparound skirt, and my sister ended up with three. I’m still not sure how that happened.) I found the red paisley in the $5-a-yard sale section at my local quilt shop. 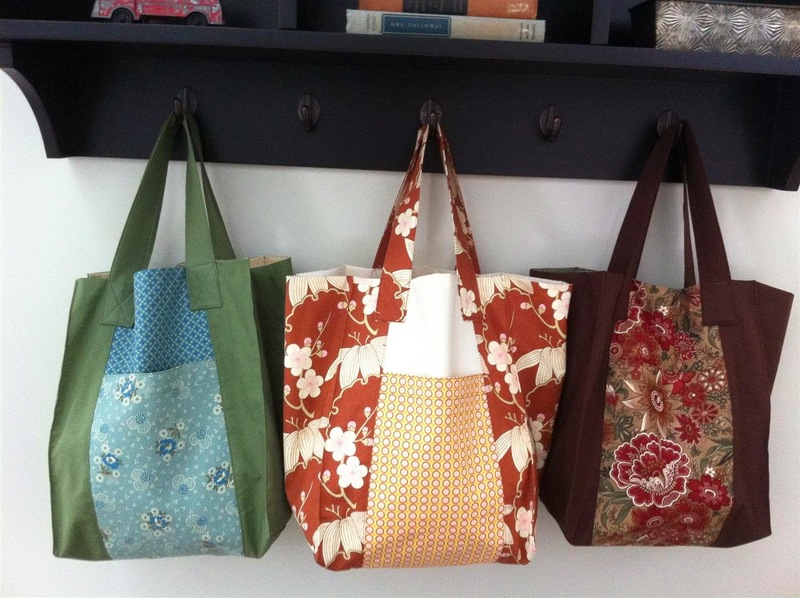 I’ve been meaning to tackle one of the bigger bags in Amy Butler’s Style Stitches (given to me by my sister a few Christmases ago, which kind of makes up for the fact that I cranked out so many wraparound skirts for her). The Cosmo Bag is huge. It’s 21 inches wide and almost 23 inches tall, the perfect dimensions for, say, toting a finished quilt to show-and-tell at guild meetings. Was it worth it? Completely. I’m thrilled that these fabrics have been put to good use. And the experience was a great confidence booster for me. When I was a new sewer, ten-plus years ago, I tried my hand at some of Amy’s designs, and they were a challenge. Although the Cosmo Bag took longer than I anticipated, I absolutely have the skills to pull it off. My mom, who has been sewing longer than I’ve been alive, witnessed my construction of the bag and admitted that there was no way she’d attempt a pattern like that. It would drive her crazy. Go me! 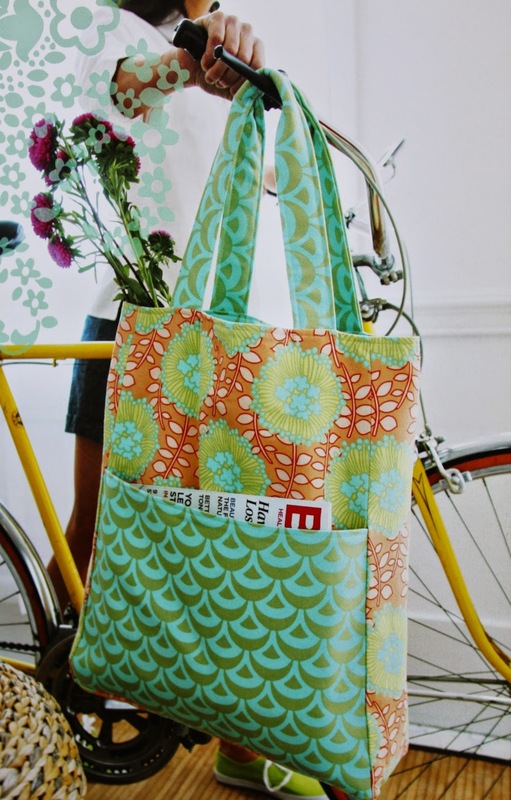 BTW: If you’re considering making your own Cosmo bag and, like me, have an early printing of Style Stitches, be sure to check out Amy’s update about the pattern. (Printings since May 2011 reflect these changes.) 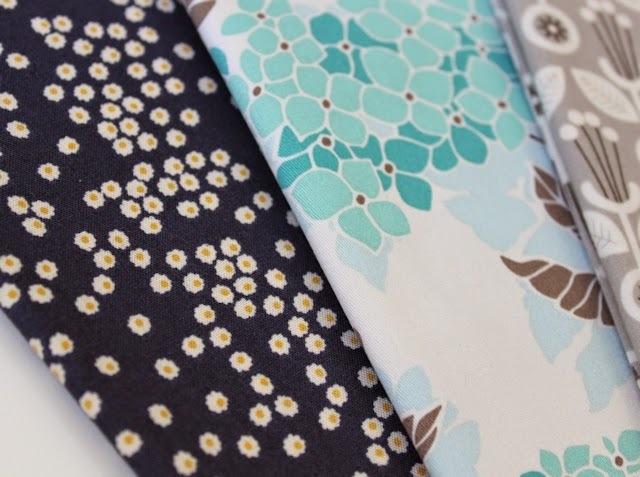 Also: You can still find fabrics from her Love line at some fabric retailers, like Hawthorne Threads. 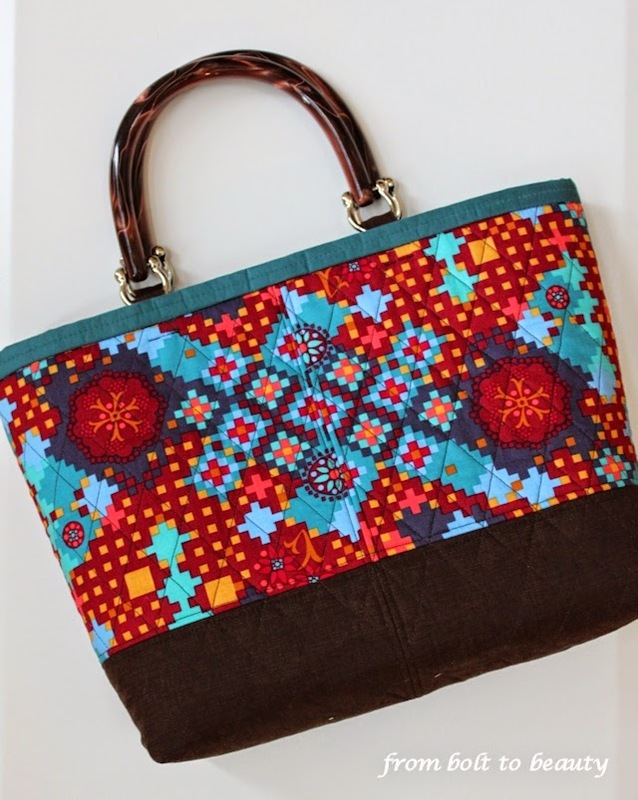 What are your experiences with Amy’s bag patterns? 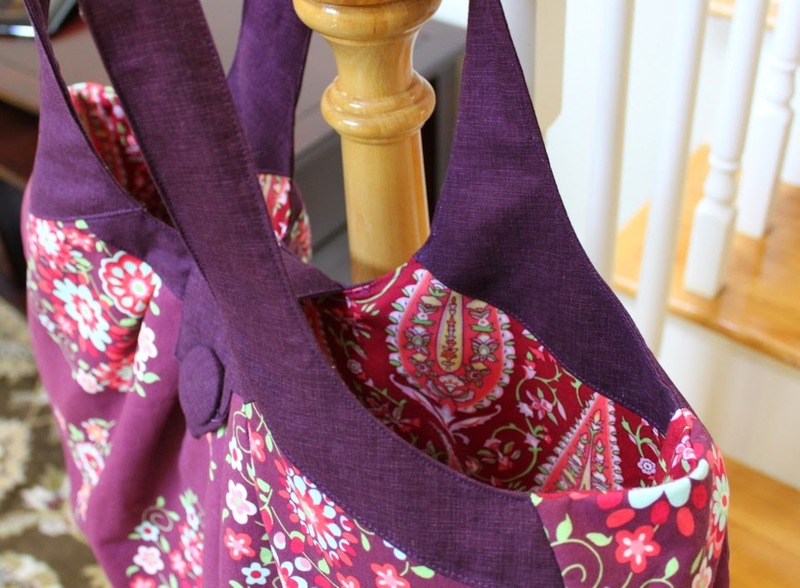 I’m looking to do the Reversible Everyday Shopper (below), also from Style Stitches, next. I’m considering the Weekender Travel Bag sometime down the road (like, sometime in 2015!). Photograph from Amy Butler’s Style Stitches. Used by permission of David Butler. And on a completely different subject ... Chelsea, of Patch the Giraffe, and I have talked about the possibility of a low-volume fabric swap. If you’re interested, leave me a comment. Oh, and I heard about all the fun happening at Craft Buds Craft Book Month. How could I say no to that?! Have you encountered—or participated in—the Around the World Blog Hop that’s been circulating online yet? Chelsea over at Patch the Giraffe tagged me last week, so here I am with my answers to the getting-to-know-me questions and two blogs I’ve, in turn, tagged for next week’s installment. I generally have two or three quilts and a small project or two in the works at a time. 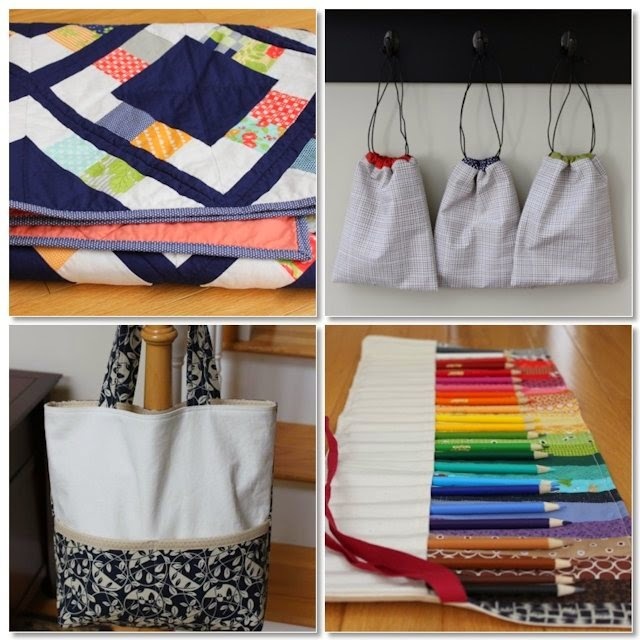 And although I refer to myself more often as a quilter than as a general sewist, I recently realized that those small non-quilt projects are particularly important to me. 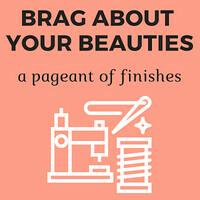 The faster, more frequent payoffs sustain my momentum and help me tackle the bigger quilting projects. My work straddles the line between the old and the new, vintage and modern. (Heck, even my house reflects that: it’s Crate & Barrel meets antique shop around here.) I can summarize my impetus for delving into quilting in two words: Denyse Schmidt. A unique quality I have is the fact that I’m the new kid on the quilt block. 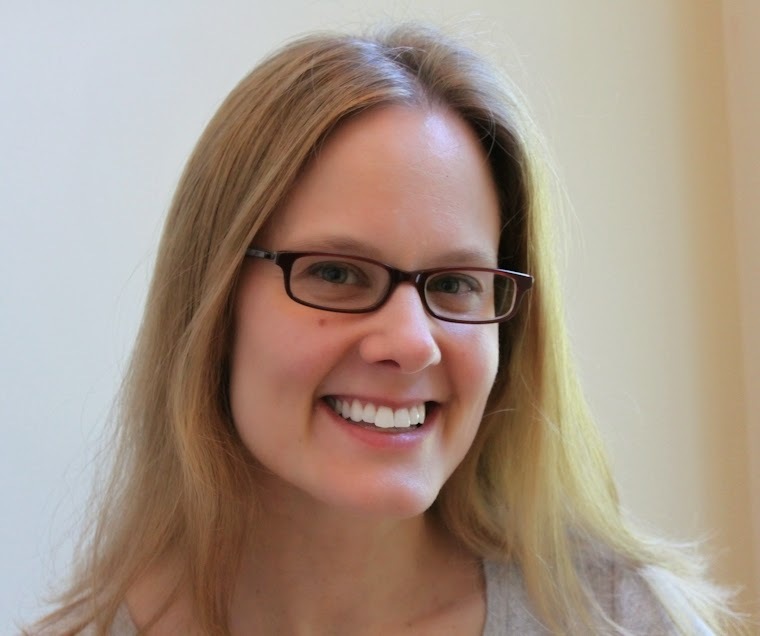 In my life before parenthood, I was in publishing, and my colleagues and I were always excited when a new hire started. This person had “fresh eyes”—an unjaded perspective that wasn’t sullied by too much exposure to the work at hand. I’ve been quilting less than 18 months; I’m on quilt #11. I’ve decided I need to work on more of my own designs before experience starts to undermine my own newbie perspective on things. 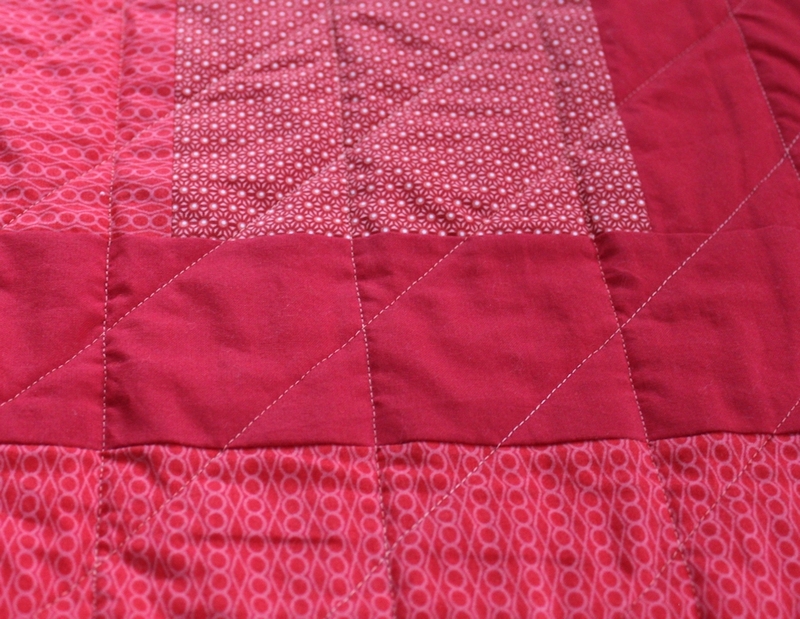 In many ways right now, I don’t know the typical way to piece certain designs or perfect certain quilting skills. I don’t know what’s possible—or not. I see that quality as a positive. It’s time to leverage it, girl! I was hardwired to create. 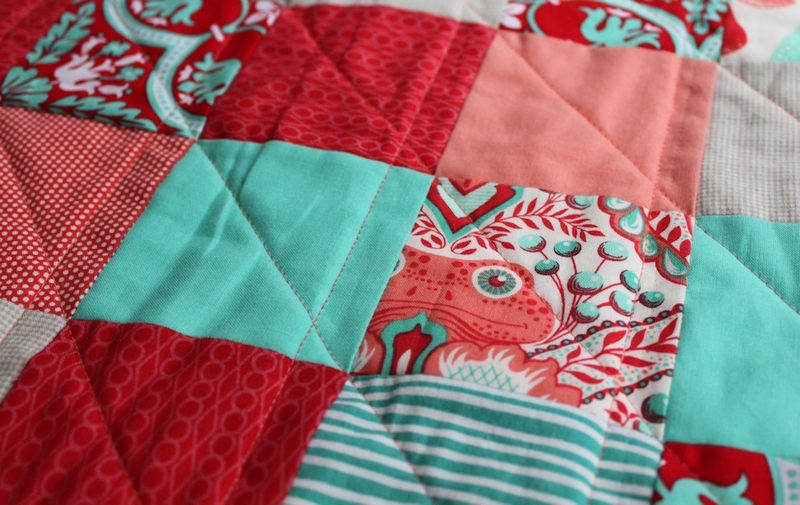 Without an outlet like quilting, I wouldn’t feel like a whole person. Honestly, it is that simple. A project for me almost always starts with a challenge. Can I piece a top like that? How can I use those scraps of fabric? Can I capture that person’s style—as well as my own aesthetic—in a single quilt? The interesting part of my creative process, which has only come to light since I started blogging, is the importance of writing about my quilty adventures. Somehow, documenting my projects in both pictures and words has become a necessary final step. It’s how I reflect on my personal triumphs and ponder the I-wishes and if-I-could-do-it-agains. Who are the next stops on the blog hop? 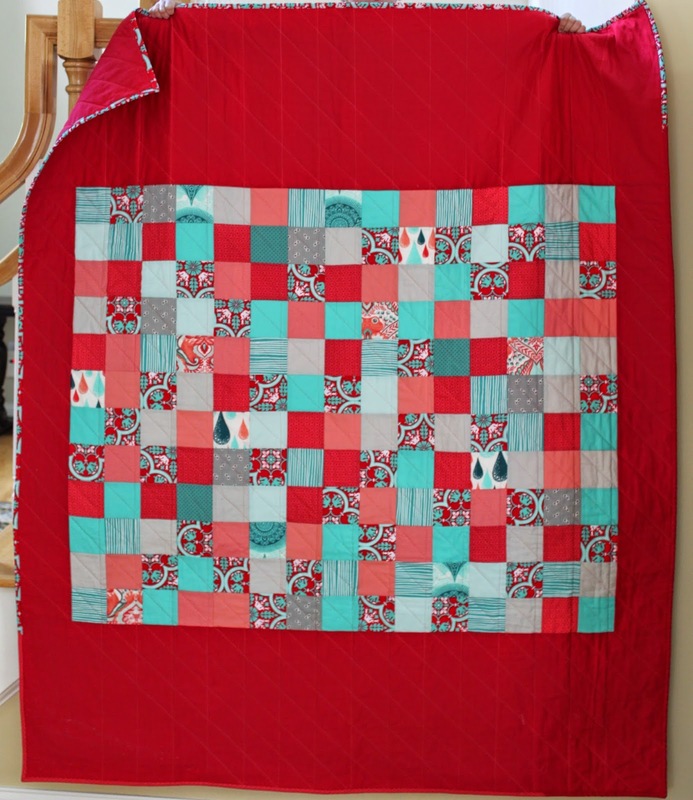 Kim at Leland Ave Studios: I started keeping tabs on Kim as soon as I encountered her Carnelian & Iron quilt, and it was following her blog that gave me the kick in the pants I needed to start my own. Her work trends more modern than mine in a way that nudges me out of my comfort zone in a good, good way. 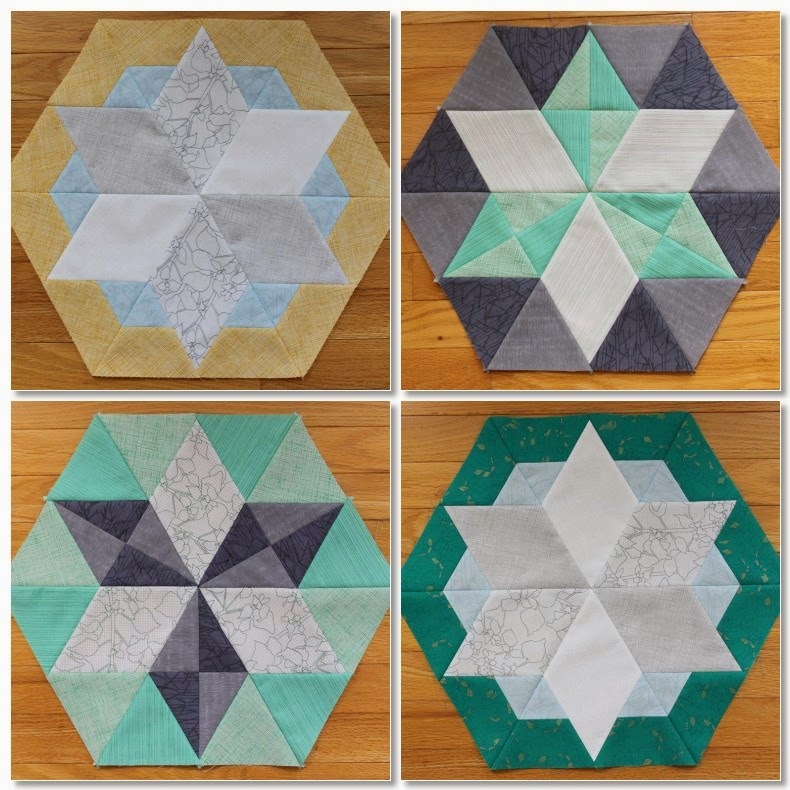 Some of my favorite projects of hers are the recently unveiled Diamonds in the Deep quilt and her Qypsy Wife quilt, the thought of which makes me curl up in fetal postion (what a huge undertaking!). Audrey at Hot Pink Quilts: Truly, the name says it all: Audrey is not afraid of color. (Like any good New Englander, I am!) A woman after my own heart, she continually strives to further hone her technical skills … on her 60-year-old Singer. Let me direct you to two of her amazing quilts: her quilt for her third sweet baby boy and her latest iteration of Jaybird Quilts’ Northern Lights pattern.